Gustav Kuhn, a cognitive psychologist and magician, studies how magic tricks work. In one study Kuhn threw a ball into the air. When it came back down he caught it, and he threw it back up in the air, his eyes following it up. He did this twice, and on the third throw he pretended to throw it up while his eyes tracked the invisible arc of its course. Two thirds of the participants reported seeing the ball vanish in mid-air, even though it never left his hand. In a second condition, he pretended to throw the ball in the air, but instead of tracking it with his eyes, he stared at the ball in his hand. In that condition only one-third of the subjects believed he had thrown the ball into the air. Participants misperceived the actual event based on their expectations, as set by the magician. It’s hard to think critically if you’re laughing. We often follow a secret move immediately with a joke. A viewer has only so much attention to give, and if he’s laughing, his mind is too busy with the joke to backtrack rationally. Teller 2012. Magic is all about an illusion it is about influencing people to experience reality according to a projected form of reality as opposed to the physics of the moment. Kind of like Bertrand Russell asking his philosophy class, is this table I am sitting on real? Putting the philosophy lecture aside for today, I think Rene Descartes provides us with a comfortable solution, “I think therefore I am”, at least it is good enough for me. If you can hold that introduction of the illussion in mind I think you will get a great sense of the wonderful illustration Nassim Taleb draws with his Turkey surprise. You see the owner of the Turkey feeds him every day with a nice meal, this continues day after day after day, so the turkey gets used to this as the continous cycle reinforces his perception of the good life. What the turkey doesn’t realize is that his life is great for 1000 days as each day is the farmers investment in getting him good and plump so that he can make an appetizing meal on Thanksgiving. All it takes is one day to shatter the illusion. Let us take this knowledge of the magicians illusion and the thanskgiving turkey and apply it to the world of finance. This knowledge is a tool for one of the great illusory cons that peddlers of financial product use to make the sale. Firstly, people like to make money a lot more than they don’t like to lose money (see: Prospect Theory and its sub-heading Loss Aversion for more) armed with that information if you can provide an investor with something that produces regular steady gains you will have suckers most of the time. It gets worse, because some investors are more astute and realize the consequences of a strategy with steady gains like in the chart above usually result in an abrupt ending, they however feel (or the salesman convinces them as much) that they will know when to get out. The signs will be obvious they believe, and yes they are correct in hindsight the signs are very obvious but through the front windshield, clear road and blue sky is what they see, after all isn’t that what they have seen for the last 1000km on the road. As in the chart above and many aspects of the financial landscape we are dealing with a zero sum game, so thinking you can identify when to get in and when to get out for those without an edge is nothing but a fools game. With that backdrop I wish to highlight 2 further examples (3 & 4) I have been thinking about as extenuation’s of the Thanksgiving Illusion. We are very familiar with this illusion with martingale strategies where traders keep doubling the trades that go against them to make a small profit if all goes according to the plan which it usually does 90% of the time. Depending on the luck of the entry into such a program you can enjoy many months of almost daily profits with very few losing days while under the martingale illusion. 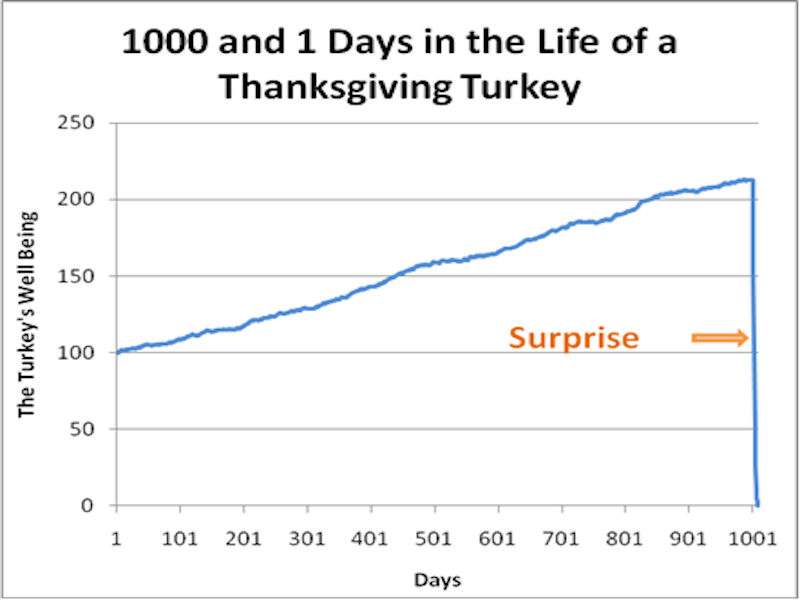 As we know martingales eventually expire like the Turkey. Another example of the same theme is when option writers sell (gamma) premium, picking up a dollars in front of the proverbial steam roller, only to have one unexpected surprise causing the trader to be rolled over flat. A newer version of this old trading them is when home owners borrow money in a foreign currency to benefit from the positive carry. I believe there were hundreds of thousands of people in eastern Europe who borrowed money in Swiss Franks for their home loan. Suddenly with the Frank shooting up they face bankruptcy with a very much more expensive home loan i.e. not only are they penalized on the increased monthly payments but if they wish to payoff the loan or roll it they have to take a major capital knock on the amount of the loan as well. I know of others doing this with the Yen. This final point is what motivated me to write this letter, I will call it the dividend trap. In the old days people bought bonds for yield and equities for capital growth. We now have a situation where equities are paying a lot more dividends than you can get in the bank or even in the bond market (see chart of the S&P500 below). With my final point about the dividend trap, I am not making a forecast that because of this high dividend yield in the market relative to bond yields that equities are going to fall over tomorrow. What I am saying is that the current market setup is an illusion. You do not get rewarded with capital growth and with more income than a much less risky fixed income investment unless you have been blinded to the risks of your investment. I feel quite categorical about this statement, the financial market place is currently operating under an illusion of fair pricing, don’t think you can safely park your money in equities and earn this high yield and enjoy steady capital appreciation forever with bond yields barely existent; and don’t think you will know when it is the right time to stop the dopamine “feel good” these regular profits are producing and having on you. I would rather “I think therefore I am” and cast away the illusions robbing us from living a real life. This entry was posted in Economics, Investments, Jung, Philosophy, Psychology and tagged @marketpsychdata, @nntaleb, Robin Robertson. Bookmark the permalink.